Miami is rapidly becoming a food lover’s destination. New restaurants open daily, one more hip, innovative and gastronomically news-worthy than the next, begging the question — where do locals keep returning to? That day I headed over to Sazon at lunch time and brought us back 2 enormous sandwiches; loaves of Cuban bread filled with ham, roast pork, Swiss cheese, yellow mustard and pickles, grilled in a press until the bread was crunchy on the outside and the cheese was nicely melted on the inside. The pickles and yellow mustard added a lovely bit of zest that balanced out the richness of the pork and cheese. A mountain of crispy, ultra-thin fries accompanied each sandwich. I was not disappointed. The extensive menu offers the gamut of traditional Cuban dishes and desserts along with little inserts of Cuban culinary and historical anecdotes. At breakfast, eggs (scrambled or fried) with ham, hash browns, a pancake, toast and freshly squeezed orange juice can all be ordered from the “specials” menu for under $6.00. They also make croissant and egg sandwiches and Pan con Timba (a Cuban bun with cream cheese and guava strips). Lunch and dinner can be ordered from the same multi-page menu which includes traditional appetizers, soups and salads such as fried plantain strips with black beans for dipping (great for sharing), empanadas (beef or chicken), croquetas (chicken, ham or cheese), tostones (smashed, double fried green plantains), black bean soup, Caesar salad, and watercress salad, just to name a few. Sazon also serves tortillas (Spanish-style omelettes) and a variety of hot and cold sandwiches. Protip: don’t forget to check out the daily specials! Sazon’s seafood entrees are always fresh and well cooked. A personal favorite is the Sarzuela de Mariscos; a medley of shrimp, calamari, mussels, lobster, clams and white fish in a hearty tomato-based Creole broth, served in a crockery casserole. While this dish is listed on the menu as one of their Wednesday night specials, insiders know it can be ordered any night of the week. 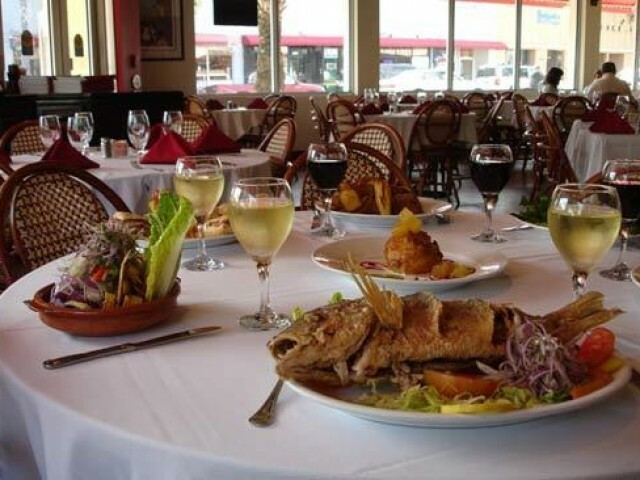 The Pargo Frito Entero (whole fried snapper) not only looks impressive, but is just as delicious. It’s crispy on the outside, moist and flavorful on the inside. Some of their other most popular dishes are the Churrasco, Vaca Frita (shredded garlicky flank steak served with onions) and Lechon Asado (roast pork). The portions are quite generous and all entrees come with a choice of two sides, black beans, moros (rice mixed with black beans), congri (rice mixed with red beans), arroz amarillo (yellow rice), yuca hervida con mojo de cebolla y ajo (boiled cassava, a starchy root vegetable cooked with onions and garlic marinade), maduros (sweet plantains), sautéed vegetables or mixed green salad. The interior of the restaurant is lively and boisterous and the staff is always friendly and efficient. Thursday nights Sazon has a guitarist playing live music. On Friday and Saturday nights, you’ll find a keyboardist entertaining the crowd. The music often inspires patrons( or on one night our server! ) to sign along, or even get up from their tables and dance a bit. Sazon has a full bar which offers a lovely sangria and well made mojitos, as will as frozen cocktails and non-alcoholic, fruity batidos and juices. There is an outdoor dining area and like all good Cuban restaurants, there’s a ventanita. The ventanita is a perfect spot to stop for a light breakfast or a quick shot of Cuban coffee and a little pastry or empanada on the way to or from the beach. Sazon prides itself in making everything fresh and from scratch, just as it would be if you were going to eat at your Cuban grandmother’s house. And just like at grandma’s house…I promise, you will not leave hungry! Sazon is open 7 days a week for breakfast, lunch and dinner; 7:00 AM-10:00 PM Sunday through Thursday and 7:00 AM-11:00 PM Friday and Saturday.